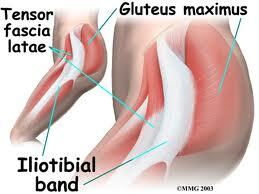 Iliotibial Band Syndrome is a common thigh injury generally associated with running. It can also be caused by biking, hiking or weight-lifting (especially squats). The iliotibial band is a superficial thickening of tissue on the outside of the thigh, extending from the outside of the pelvis, over the hip and knee, and inserting just below the knee. The band is crucial to stabilizing the knee during running, moving from behind the femur to the front during the gait cycle. The continual rubbing of the band over the lateral femoral epicondyle, combined with the repeated flexion and extension of the knee during running, may cause the area to become inflamed. Iliotibial Band Syndrome symptoms range from a stinging sensation just above the knee joint (on the outside of the knee or along the entire length of the iliotibial band) to swelling or thickening of the tissue at the point where the band moves over the femur. The pain may not occur immediately during activity, but may intensify over time, especially as the foot strikes the ground. Pain may also be present below the knee, where the ITB actually attaches to the tibia. ITBS can also occur where the IT band connects to the hip, though this is less likely as a sports injury. It commonly occurs during pregnancy, as the connective tissues loosen and the woman gains weight - each process adding more pressure. Dr. Michael Horowitz offers a 5-Step process to successfully treating Iliotibial Band Syndrome. He can help evaluate & diagnose your condition and recommend the best course of action for you. Call Vancouver Orthotics at 604-737-3668 for more information. What is the most effective treatment for iliotibial band syndrome? What exercises & stretches do you recommend for iliotibial band syndrome? What other symptoms are most commonly associated with iliotibial band syndrome? What shoes are best for iliotibial band syndrome? Where can I get medical hardware for iliotibial band syndrome?